There are no guarantees in free agency, but some players can present more risk than others. We’ve seen elite, or close to it, play from all the guys below. We’ve also seen ugly seasons from all of them as well, and that gives us pause. These are the most high risk, high reward free agents on the market this offseason. You don’t even need advanced stats to tell you this one. His yearly sack totals are as follows: 1.5, 4, 10, 2, 13. Two of those things are not like the other. 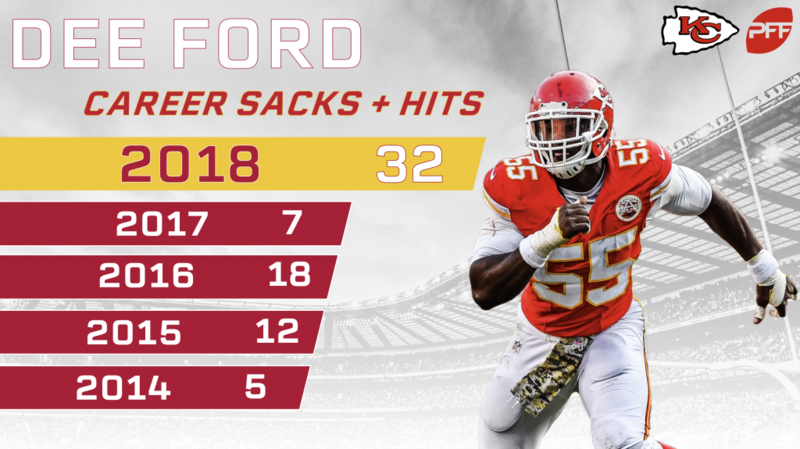 To be more accurate, it’s more like one and a half of those things is not like the other as 6.5 of Ford’s 10 sacks in 2016 came in a three-game stretch. The grades tell the story even more starkly. Ford’s highest pass-rushing grade prior to earning a 91.0 during the regular season in 2018 was a 66.9 back in 2016. Injuries can be partially to blame, but if a guy can go from elite to bum with a minor injury, that’s the definition of risky. Similar to Demarcus Lawrence a year ago, Ford looks to be a prime candidate for the franchise tag. Williams was one of the best right tackles in the NFL back in 2017 when he earned a 77.2 overall grade. The problem is, he’s suffered to major knee injuries since then with the last one putting him on IR for the entire 2018 season. He’s played all of 1,925 snaps in his entire career – not even quite two full seasons worth. Williams may have to take a one year deal to prove that he’s healthy once again. All the hype surrounding the former first-round pick stems from one outstanding season all the way back in 2015. 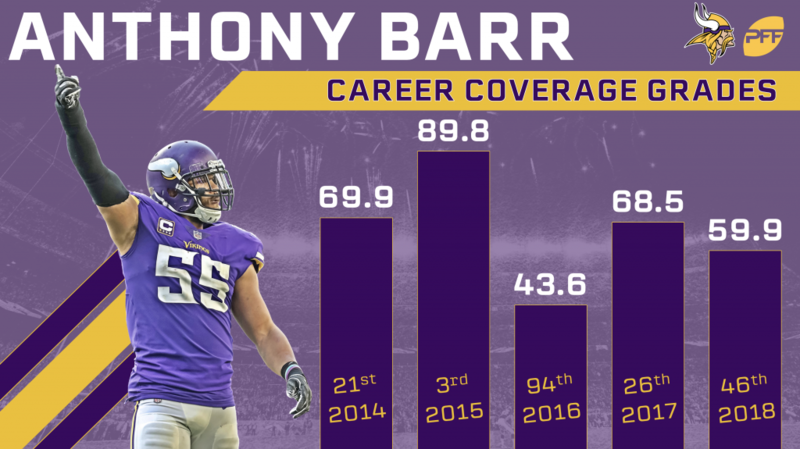 That year, Barr looked like the future of what the linebacker position could be in the NFL; a linebacker that could rush the passer like an edge and cover like a safety. He racked up 27 pressures on 110 pass-rushes and earned grades of 90-plus in both pass-rushing and coverage. Unfortunately, Barr hasn’t been able to match either since. 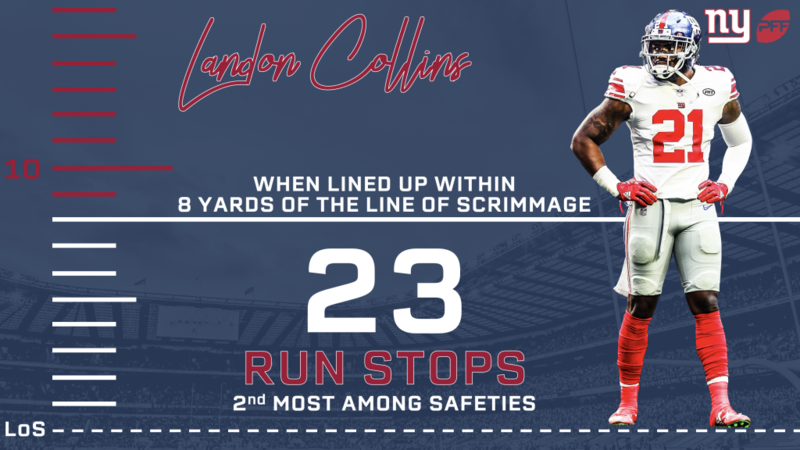 He’s not even earned a grade over 60.0 in coverage over the last three seasons and has gotten routinely exposed when asked to cover down the field. The linebacker is still one of the best blitzers in the league, but without the coverage prowess that’s not all that valuable. For a good portion of his career, Roby was thought of as one of the best nickel corners in the NFL. Part-time isn’t quite the same animal as having to be on every single snap. When he took over for Aqib Talib as the starter this past season, Roby had by far the worst season of his career by every single measure. His 59.9 overall grade, 65.9 percent catch rate, 807 yards, and 117.3 passer rating against were all career worsts. It was a far cry from the player who was so critical to the Super Bowl run in 2015 when he allowed fewer than six yards per target. Being a lockdown nickel corner has a lot of value, but teams still aren’t shelling out big bucks for that role. Collins being the lowest-graded safety in the NFL isn’t something that concerns me. The fact that he’s never been able to replicate the dominance we saw from him in 2016 is what should give GM’s pause. That season he racked up 49 defensive stops. In the two years since, he hasn’t had more than 37. Combine that with the fact that he’s looked like a completely different player depending on the role he’s been deployed in. Collins is far more effective playing around the line of scrimmage compared to backpedaling as a deep safety. He’s not a plug-and-play safety and needs a certain job description to be effective. If you put him in that role though, I wouldn’t be too worried about his performance.